Minecraft is coming to the Xbox One, because of course it is. At this point Notch's open-world sandbox hit Minecraft should just be seen as ubiquitous. If I say to you "Microsoft just revealed that Minecraft will be appearing on the Xbox One," you should respond with "that is not surprising in any way, please tell us something new." Unfortunately, I can't. When Microsoft opted to reveal the title at its ongoing E3 2013 press conference, the company showed only a few brief moments of video, none of which offered us anything that can't already be found in the Xbox Live Arcade iteration of Minecraft. Owing to the game's purposely blocky graphics, it doesn't even seem to feature any aesthetic improvements. 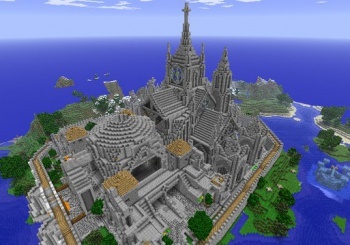 We're hoping that the increased power of the Xbox One will allow its incarnation of Minecraft to more closely ape its PC source materia as far as increasing the potential size of in-game worldsl, but since Microsoft said nothing of substance about the title we can't even really be sure of that. Expect Minecraft to hit the Xbox One either at launch or shortly thereafter. I wish I could give you a more solid release date, but again, Microsoft loves to play coy. We'll bring you more whenever the company is ready to hash things out properly.